What's worse than hiring scantily-clad "booth babes" to show off gadgets at an electronics conference populated mostly by men? Sending lascivious tweets about their appearance from the official company account. Which is precisely what Taiwanese hardware maker ASUS has just done. 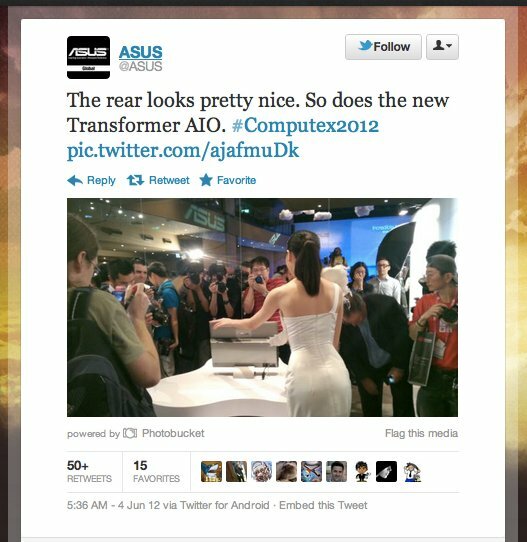 ASUS' post, which smacks of sexism, shows a photo, taken from behind, of a shapely woman displaying ASUS' Transformer AIO tablet to a crowd of men and encourages followers to check out the woman's "pretty nice" looking "rear" (See the tweet below). Claims of sexism in Silicon Valley often get short shrift. In a story posted Sunday, author David A. Kaplan told The New York Times that while the tech industry is known for fun and games, sexism just doesn't square with its reputation. "You don’t really hear about randiness and mistreatment of women. That doesn’t prove it’s not there, but that’s not the lore," Kaplan told the paper. It looks like it might be time to rethink the lore. The tweet sent several hours ago from the ASUS account offers yet another example of why the tech industry often leaves many women feeling like second-class citizens in a for-profit frat house. The blatant ogling of her appearance in the reference to her rear sounds like a dirty joke that would be shouted between boys over beers at a bar, a seemingly odd choice for a professional company that presumably hopes to attract women, as well as men, to its products. ASUS' tweet was retweeted more than 50 times and favorited by more than 15 users, a strong showing considering the official Twitter account has just 253 followers (Update: now 302). One apparently delighted user replied, "ZOMG!!!! :D :D."
Twitterer Leigh Honeywell was less impressed. "hey Asus, do you not want women as customers or something? Not cool," she wrote in response. 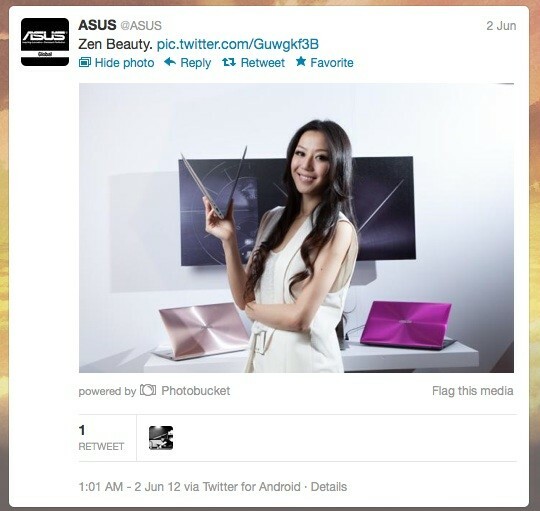 Many of the retweets included criticism of ASUS' decision to post the photo and its caption. 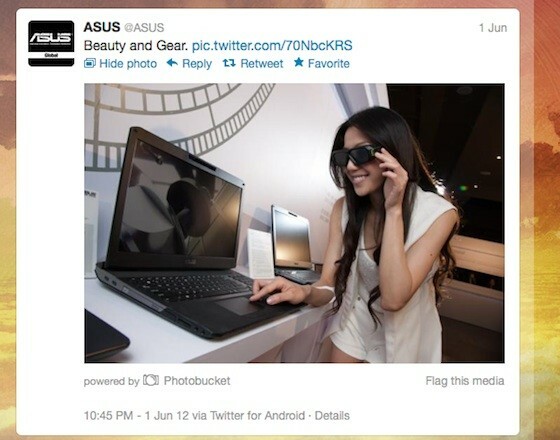 "So the official @Asus account wins the award for "most misogynistic PR tweet of 2012," wrote one user. Another wrote, "I would LOVE to buy that @ASUS laptop, but I'm a sexual object and can't get my woman hands to order one! If only I were a valued customer." ASUS did not immediately return a request for comment. The post comes just a few weeks after respected venture capital firm Kleiner Perkins Caulfield and Byers was hit with a sexual harassment lawsuit by investment partner Ellen Pao. She alleges that she and other female employees were passed over for opportunities because of their gender. At a panel held at the TechCrunch Disrupt conference shortly after news broke of Pao's lawsuit, the all-male lineup dismissed the notion that Silicon Valley was plagued by sexism. But the real question is whether instances of sexism, like ASUS' tweet, are "pockets of issues," or reflect a bias that's woven into the fiber of Silicon Valley. And just what would it take to convince the tech industry that it's the latter? UPDATE: ASUS has apologized for the controversial tweet it posted earlier Monday, promising it will "take steps to ensure this doesn't happen again."